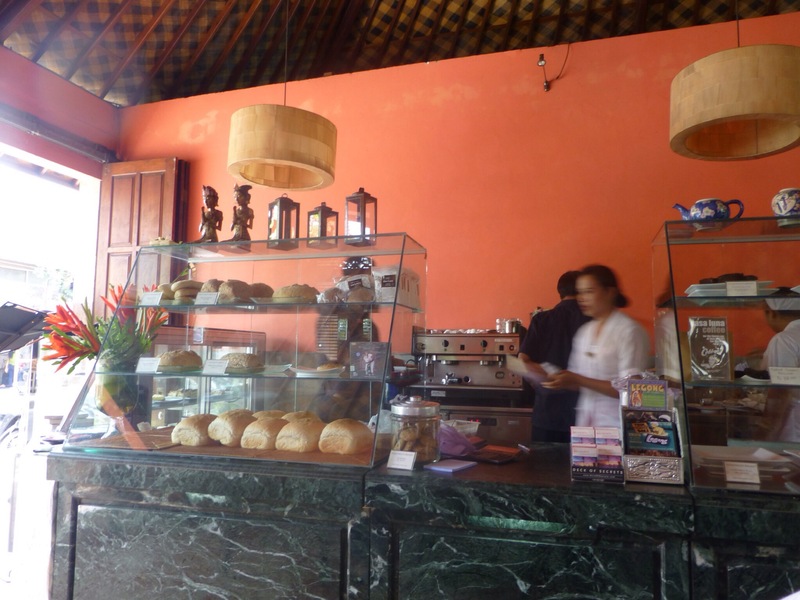 Each morning we have been having our daily coffee fix at the lovely Casa Luna in Ubud. Situated in Jalan Raya it is only a hop, skip and jump from our guesthouse. 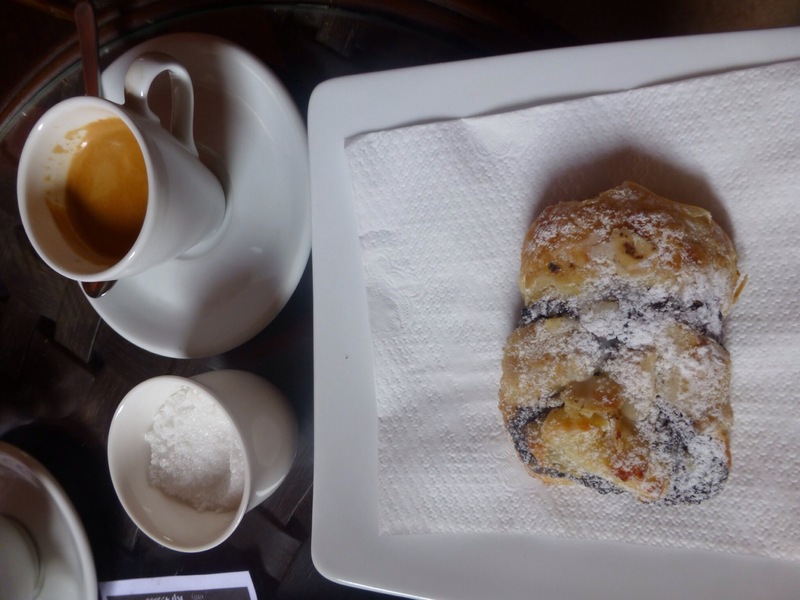 The coffee here is stunning and the pastries to die for! Casa Luna is open all day for lunch and dinner too. They also have a cooking school which has great reviews. 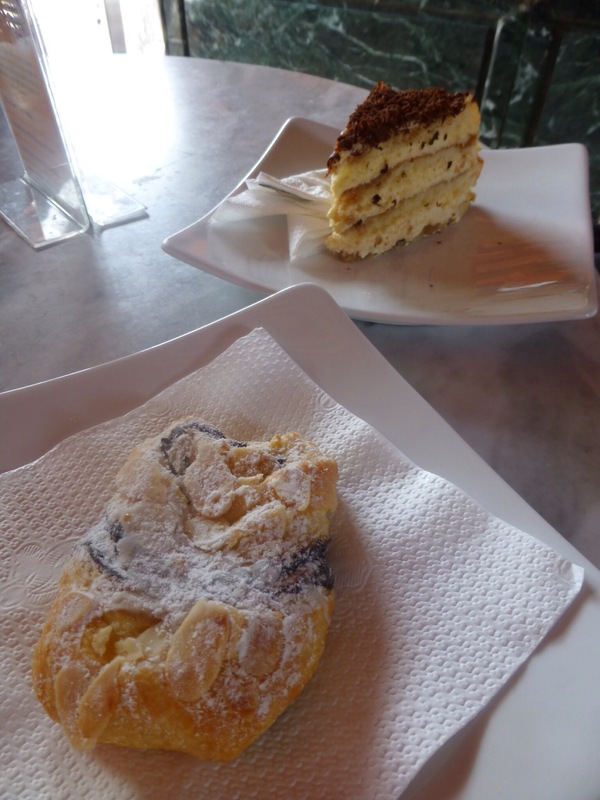 One of the memorable meals we had in Wellington this trip was at the Havana Bar Restaurant. 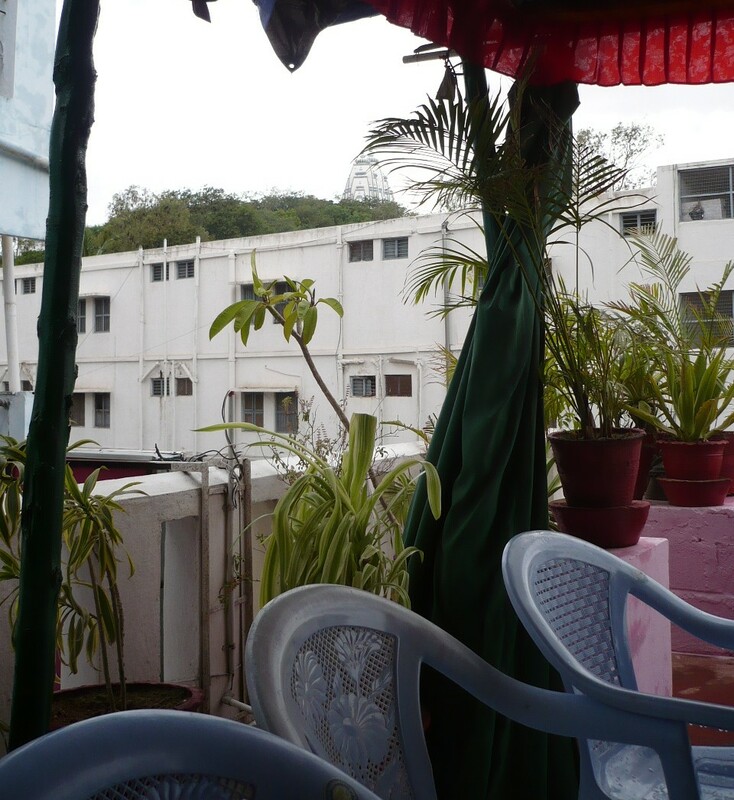 Located next door to the Havana Bar it is a wonderful match for its neighbour. 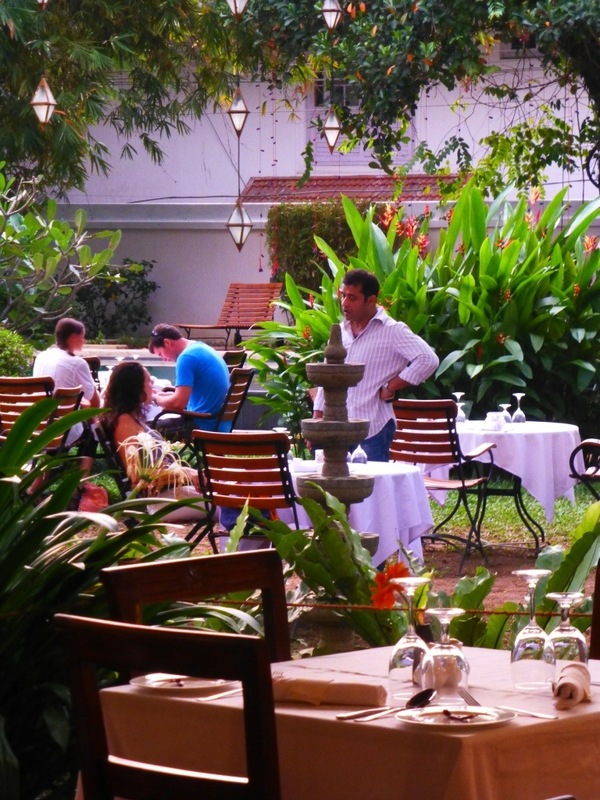 The Havana Restaurant is light, airy and filled with wonderful aromas drifting from the open style kitchen. Dave is the head of staff in the kitchen here. He is a cute and friendly chap and we had a lovely chat to him after our meal. The meals are tapas style which is a wonderful way to get a small taste of lots of dishes. Although the dishes are to share they are extremely generous in size. Dave and his staff use the freshest of New Zealand produce and have developed a menu which is extensive and delicious. We were attentively served by lovely Sean. His tips and suggestions went down a treat with our group of six people. Havana’s Spanish inspired seasonal tapas dishes will delight and inspire you. 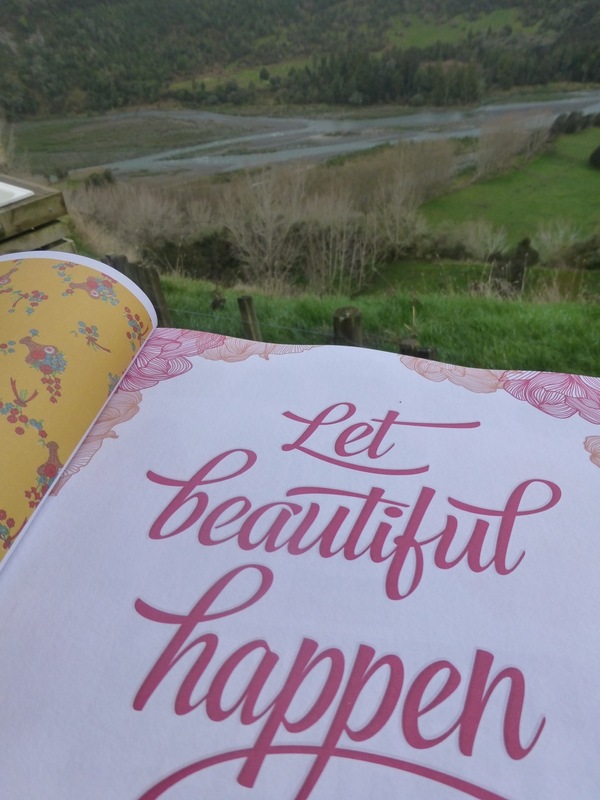 It is a perfect spot to while away a glorious afternoon in wonderful Wellington. Yesterday we farewelled the Islington Hotel and set off to explore Hobart’s surrounds. But before we left there were still a few shops that we could not miss! 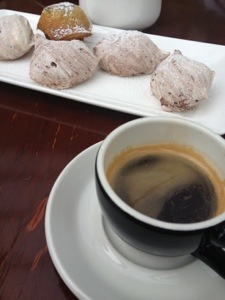 After breakfast we headed to Petit Marche at 150 Elizabeth Street, Hobart. 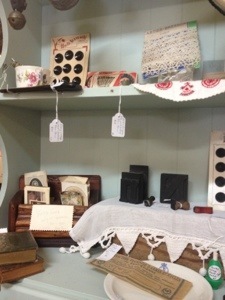 Here Beth has an amazing shop packed full of divine vintage all-sorts, French antiques and local made cuties. I shopped up a storm here buying antique buttons, divine antique French religious cards (50c), books and retro postcards. Our next stop was the heavenly Oyster and Pearl. 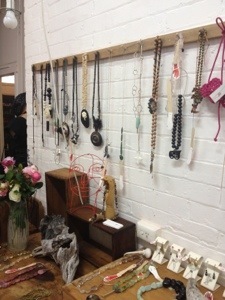 Lou has created the most special boutique space upstairs at 147 Liverpool Street, Hobart. Oyster and Pearl stocks lovely linen and fabbo print clothing, funky jewellery and arty wire works by Melissa from the Sunshine Coast. We loved chatting to Lou ~ she was a wealth of knowledge on all things about Hobart. 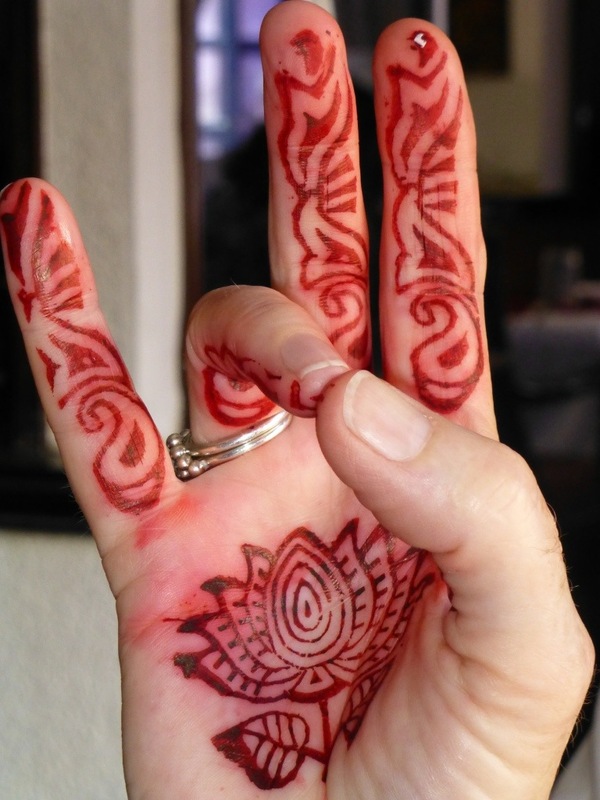 Melissa’s sister is Carmen and her cute shop is called Red Hand Design. 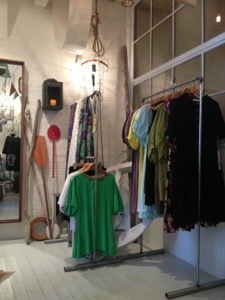 Here she sells vintage clothing and jewellery re-worked by Carmen to have a new life. If traveling to Hobart please don’t miss any of these shops or you’ll be sad, sad sad! We then travelled south of Hobart towards the Huon Region. 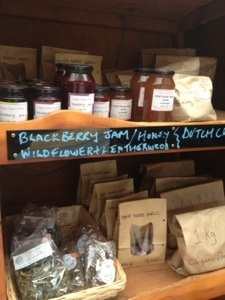 Along the way we stopped at quaint farm stalls and bought some home-made raspberry jam and purple garlic. Look out for these farm stalls on the side of the road all around Southern Tasmania – they have some wonderful produce which you purchase on an honesty basis. You leave the money in the box provided. 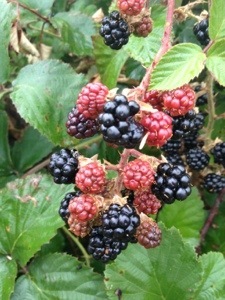 Another delight from the side of the road, in late summer, is the blackberry. Rahul and I have been gorging ourselves on hand picked, wild blackberries each day. 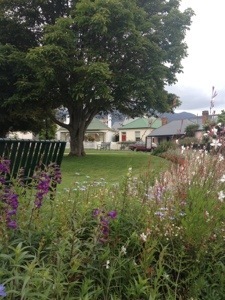 Last night we stayed at the Huonville Guesthouse. 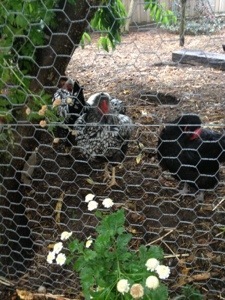 We chatted to the chooks right near our room as we had our breakfast this morning. Our cereal was topped with lovely fresh apricots picked from the trees growing in the garden of the guesthouse. The destination is… Tasmania, Australia and the Apple Isle is definitely living up to its reputation! We arrived into Hobart through a thick bank of cloud to a lovely mild day. 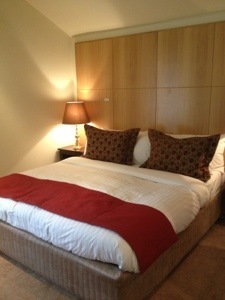 After picking up our hire car we headed the 20kms into Hobart city to our divine hotel ~ The Islington . After checking in and having a lovely morning tea in the conservatory we headed off to explore Hobart. We headed straight to Salamanca Wharf right on the Derwent River. Here you look over the moored boats and yachts to the hills beyond. 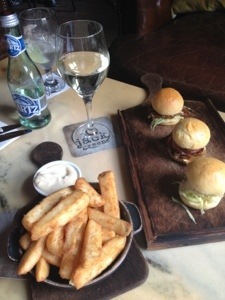 We had a very tasty lunch at the atmospheric Jack Greene Tavern. 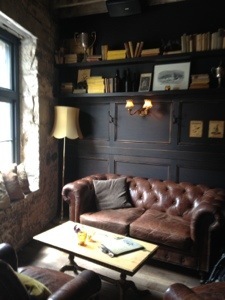 Make sure you sit upstairs amongst the books and memorabilia. 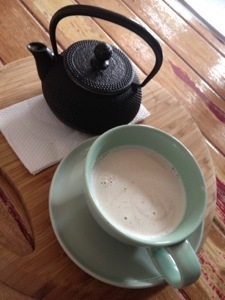 It has a great relaxed feel and our waiter was so helpful about Tasmanian places of interest. 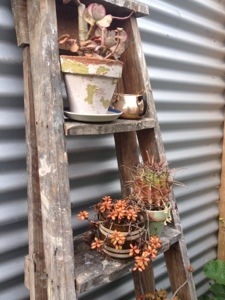 Located at the Salamanca Wharf are lots of quirky and cute shops showcasing unique Tasmanian fine art and design. Look out for The Maker and Spacebar Gallery. We then headed just around the corner to Battery Point. 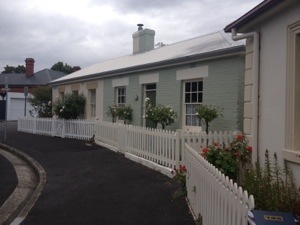 Battery point is a darling pocket of Hobart with cute houses, handkerchief size divine public gardens and sweet little shops. 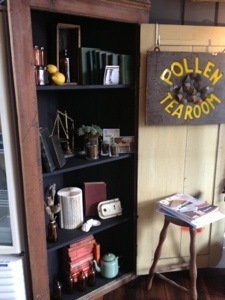 We had a divine milky chai at the Pollen Tea Room. The great guy there grinds his own chai paste and it was individual and memorable. 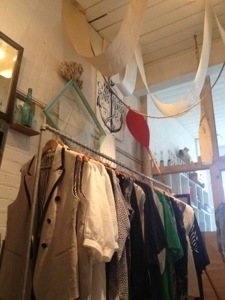 We then popped in next door to the gorgeous Lionhart boutique. 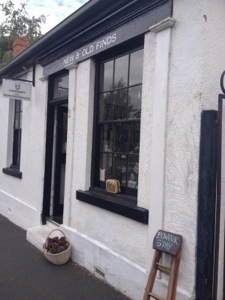 This extremely tasteful little shop sells quirky jewellery, vintage clothing pins, Tasmanian knick knacks and pillowcases. The delightful girl there also recommended some other shops to discover…yippee. After all that retail therapy and eating we decided to visit Mt. Wellington. It is only a short, but very windy, drive from the centre of Hobart. Mt. Wellington is 1270 metres above sea level and the temperature is much cooler once you are up there. 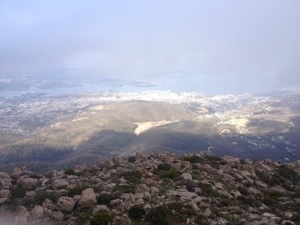 They have a wonderful lookout which gives you a superb view over Hobart and its surrounds. After a fantastic day exploring Hobart we had a tasty dinner back at The Islington of seafood chowder and wild mushroom risotto…mmm…a great way to end a perfect day! Not only are they delicious but good for you too. The yoghurt/curd used in the lassi helps to keep your tummy happy which is an extra bonus for those travelling in India. 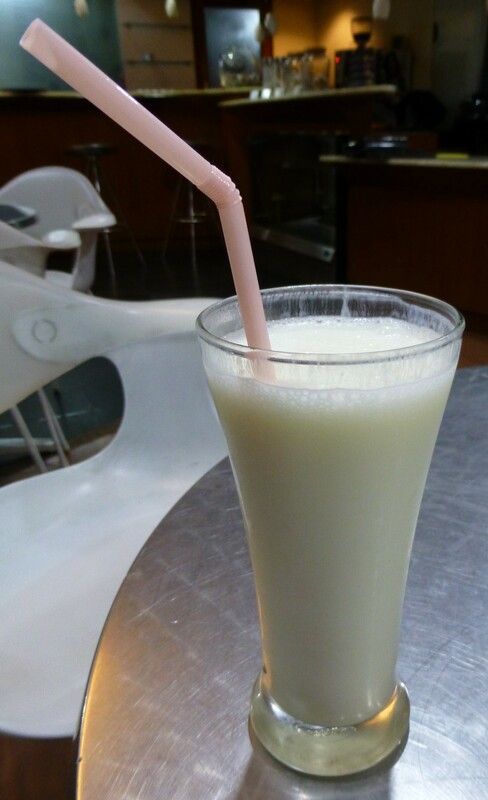 A lassi a day keeps the tummy bugs at bay! Place the yoghurt/curd, water/milk, sugar and rose-water in a blender. Blend till the lassi is smooth. If you would like a fruit lassi just add your desired fruit into the blender too. 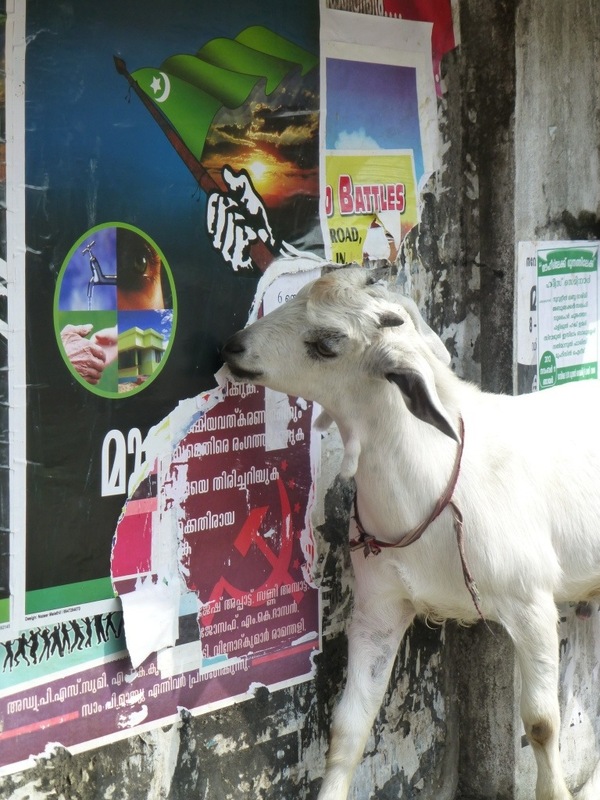 When travelling in India you will find lassis on nearly all menus. 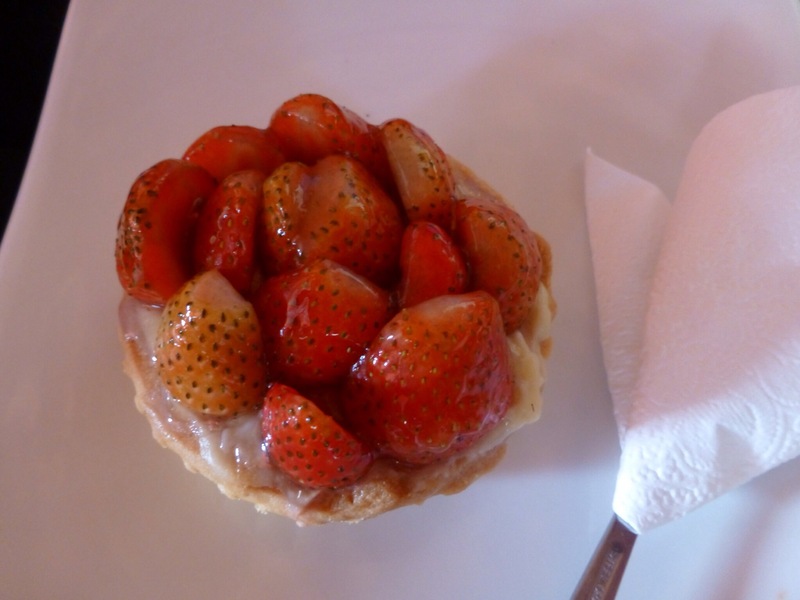 Our family have road tested many lassis on our trips and although they vary widely they are all individually delicious. 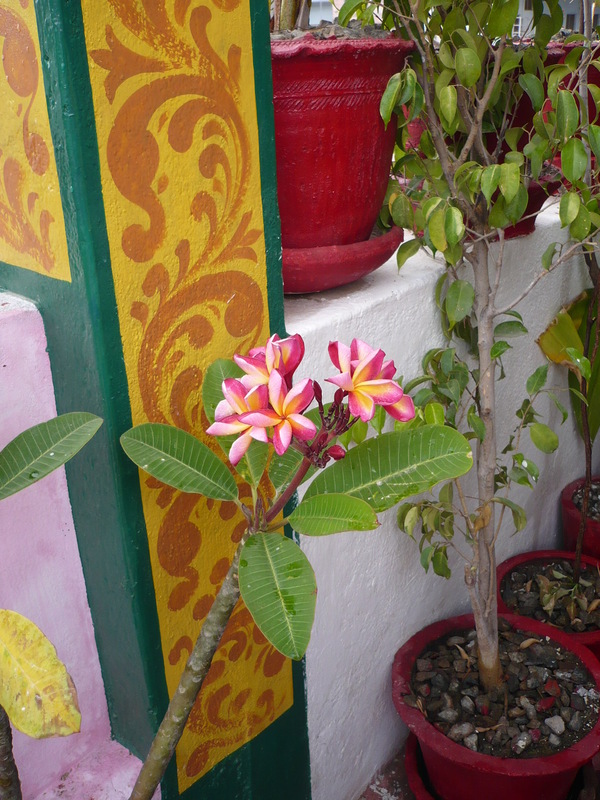 Everything looked fresh and beautiful at our hotel this morning after the pouring rain last night. 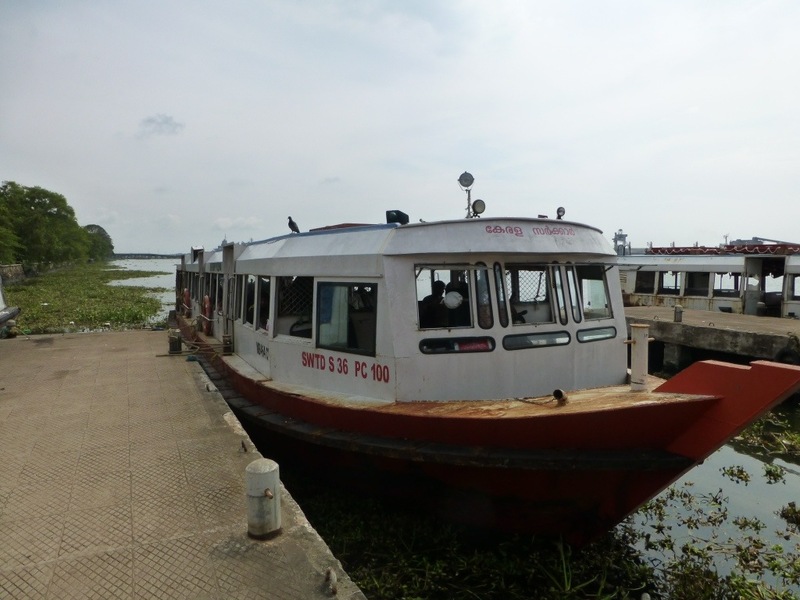 We had a tasty breakfast of Marsala omelette and then Padma and I headed for the local ferry wharf. 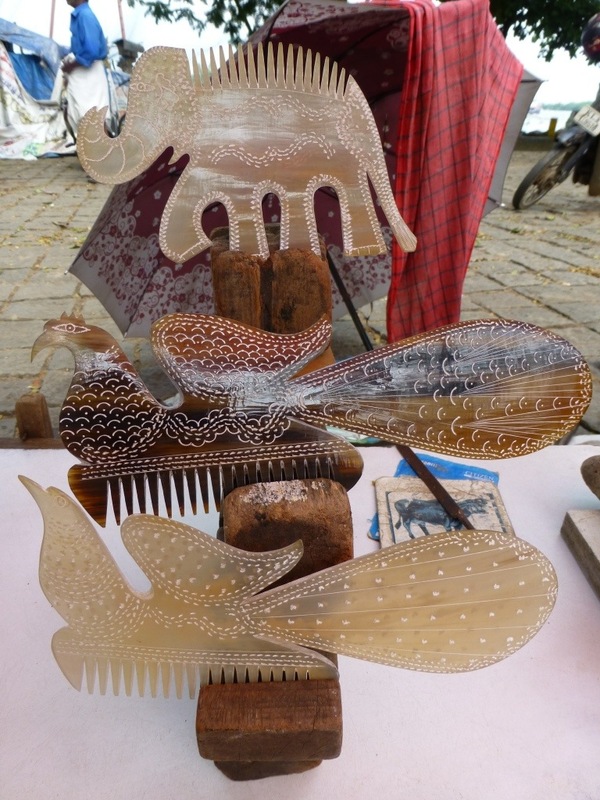 I bought a beautiful carved buffalo horn comb along the way. 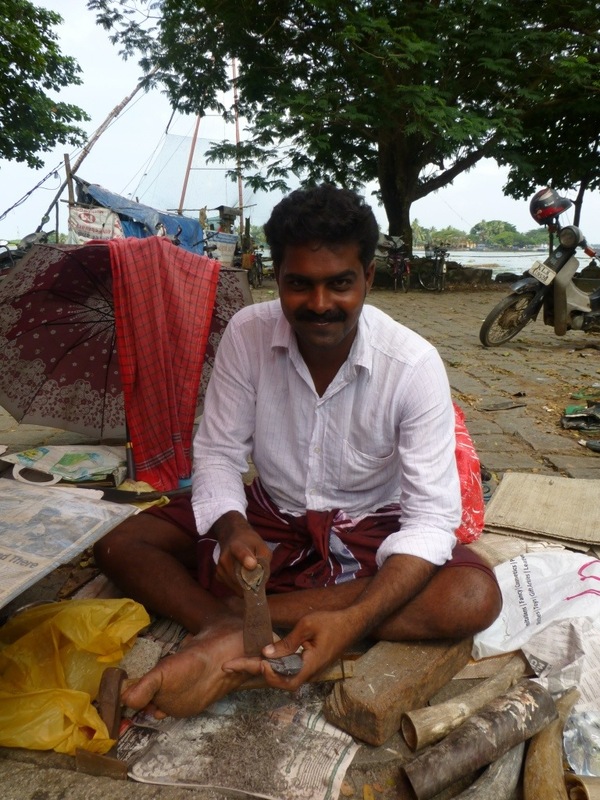 The carver showed us the article about himself in the Cochin Times. 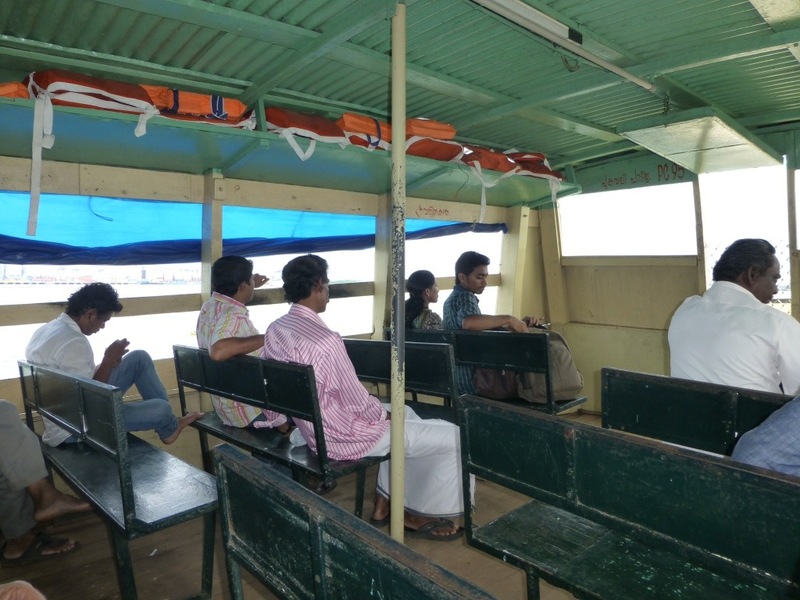 We caught the ferry to Ernakulum (2.5 rupees each). It was a very scenic trip passing fishing boats and navy vessels. At Ernakulum we walked a short distance up Shanmugham road to Bimbi’s restaurant for a refreshing fresh, sweet lime soda. 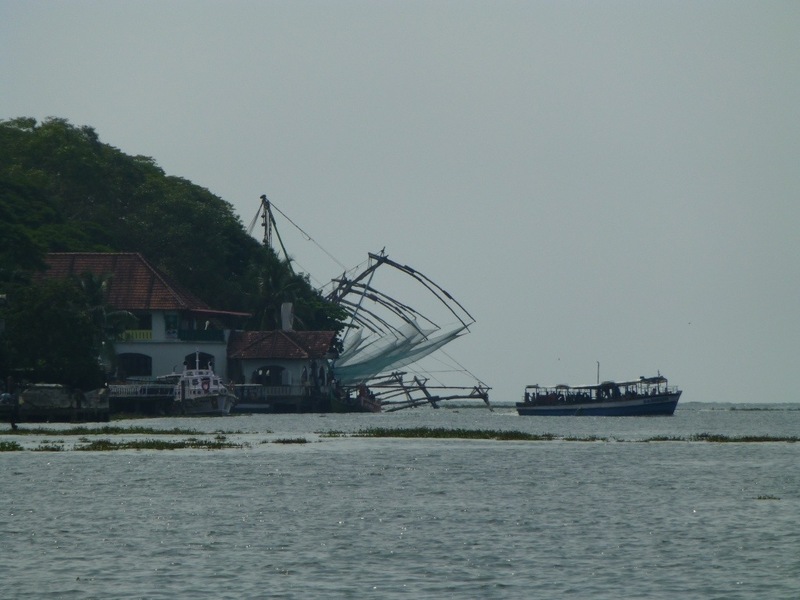 On the return journey to Fort Cochin we got a great view of the old fort area. 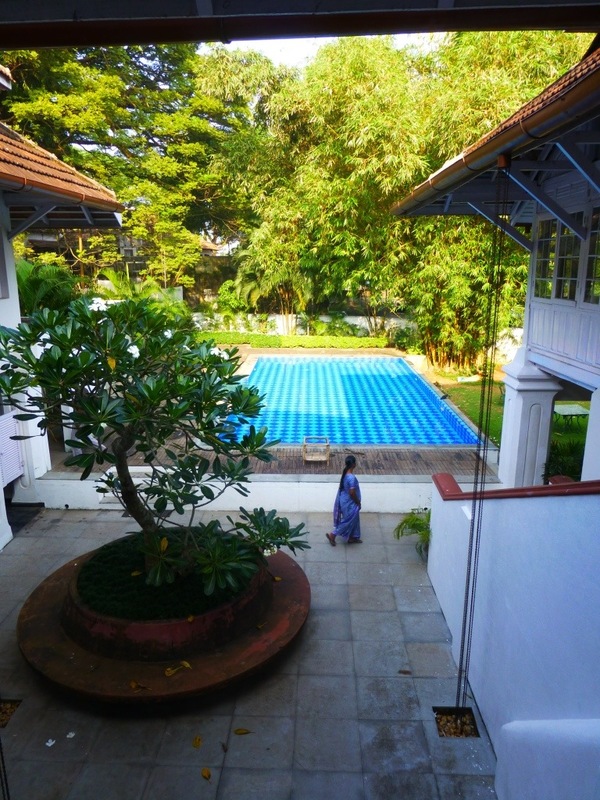 The ladies at this spa are really delightful and I highly recommend you visit when you are next in Fort Cochin. Tonight we had a tasty dinner at the Fort Heritage Hotel (1/283 Napier Street). 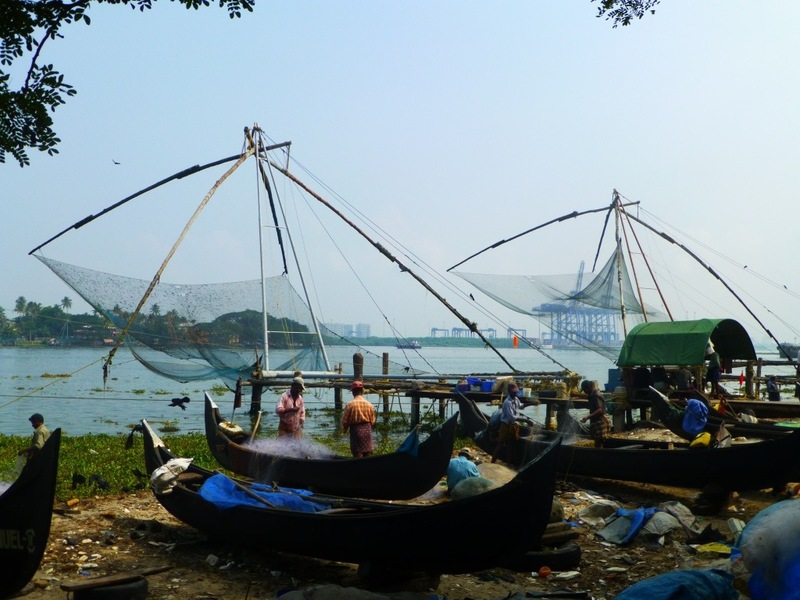 This morning Padma and I went for a stroll along the Fort Cochin waterfront to look at the old cantilevered Chinese fishing nets. Here fishermen were dispersing their overnight catch of fish to the various fish sellers. 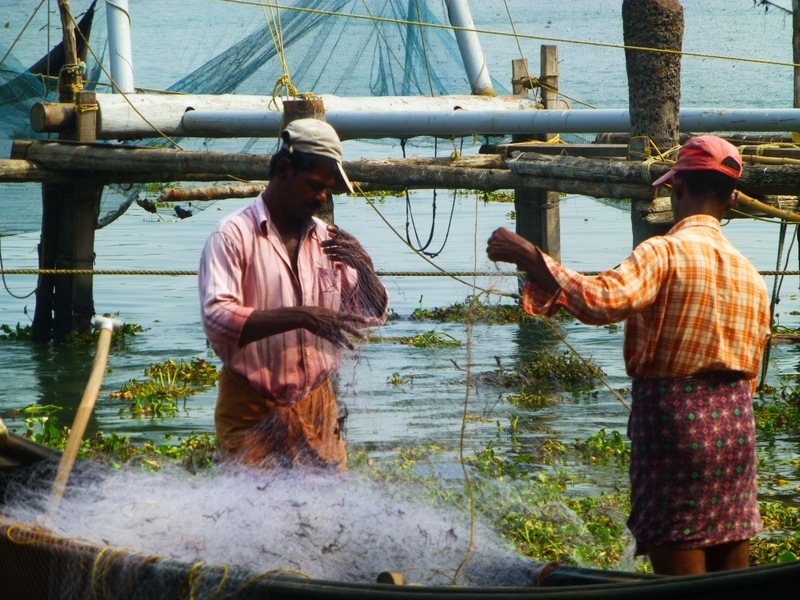 The Chinese fishing nets are called cheena vala in Malayalam. They are used at high tide and take about four men to operate due to their huge size. We then moved hotels to the Old Courtyard Hotel (www.oldcourtyard.com). We like changing hotels as it often gives you a different perspective of the same town. 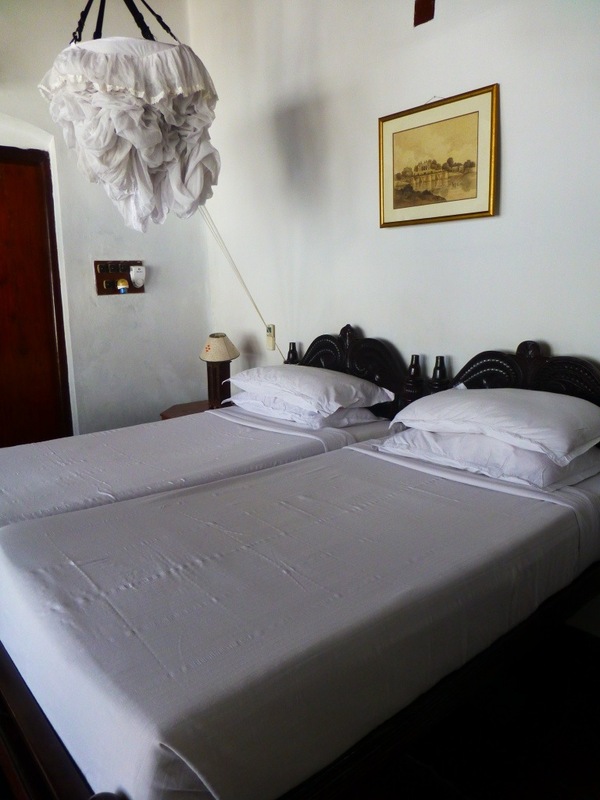 The rooms here are really gorgeous with crisp white sheets and lovely antique furniture. We had a lovely walk down some peaceful lanes to visit the massive Catholic Santa Cruz Basilica in Peter Celli Street. 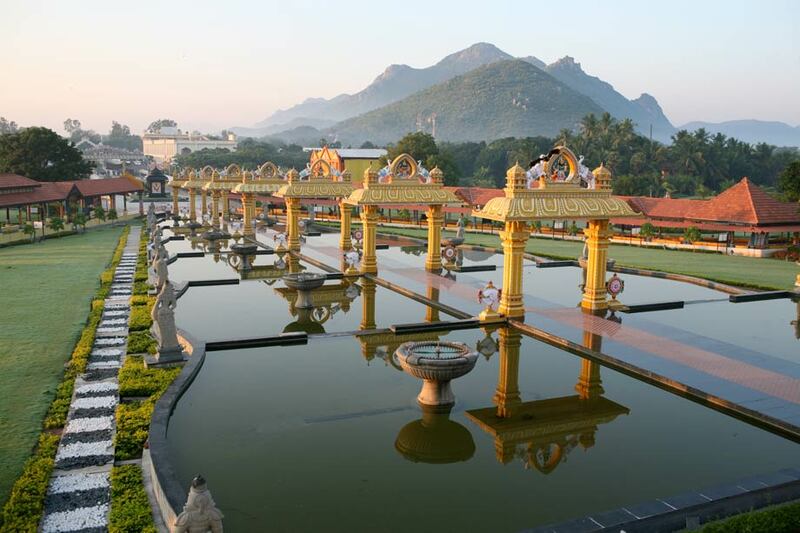 The interior is extremely ornate with streaked brown marble and pastel painted finishes. 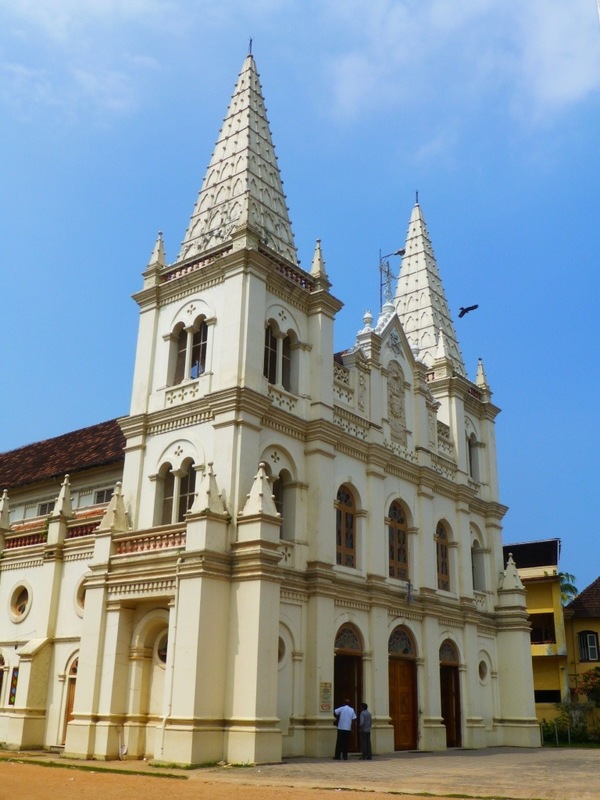 The Catholic Churches are just like all religious shrines and temple in India – colourful and eye catching. 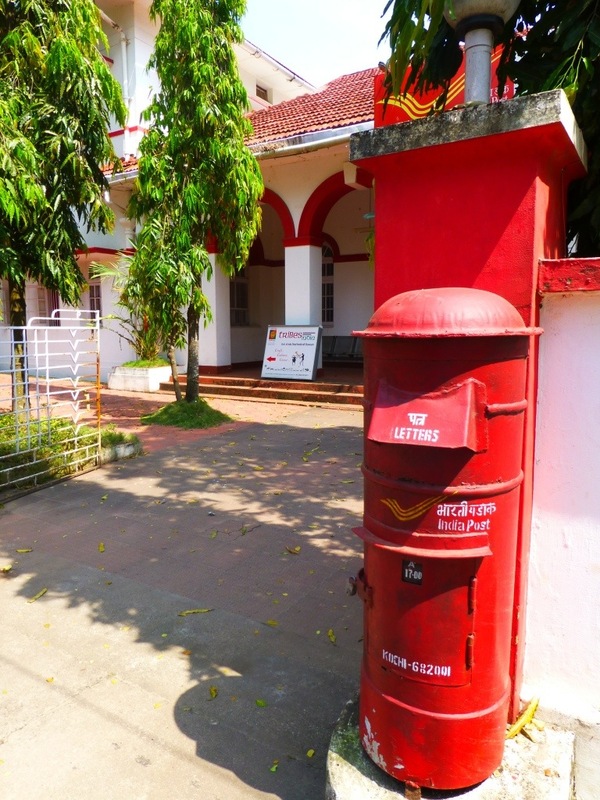 If you wish to send your postcards there is a lovely old post office in Post Office road. It is open 9-5pm Monday to Friday and until 3pm on Saturdays. We caught an auto-rickshaw around to Jew Town to visit the Pardesi Synagogue. 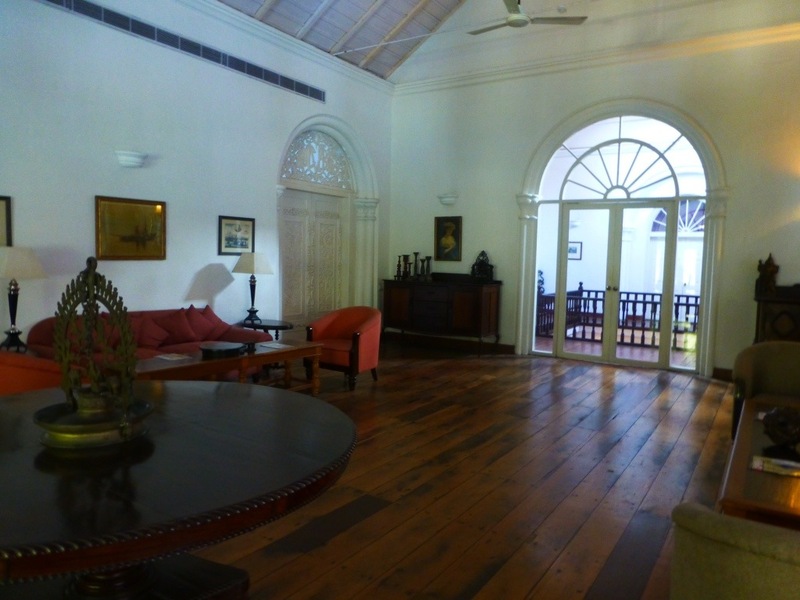 The building was built in 1664 and houses some great paintings which illustrate the Jews history in Fort Cochin. The Synagogue itself was tiny and absolutely divine. 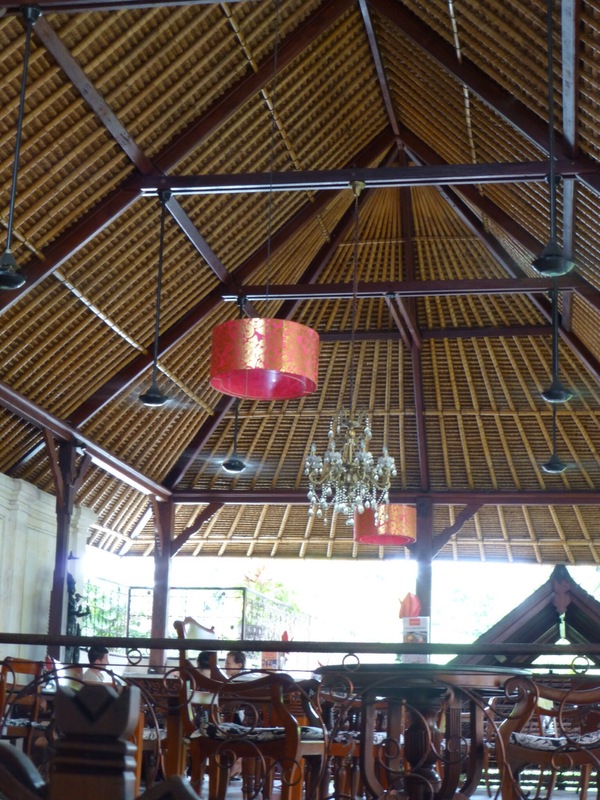 We sat on old rattan pews and gazed up at the myriad of glass chandeliers and the old blue and white Dutch tiles on the floor are all individual and hand painted. 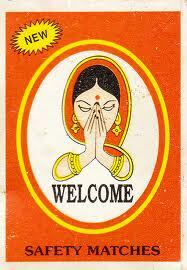 The entry fee is 5 rupees. 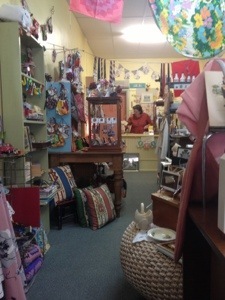 If you are into antiques Jew Town is your place as old wares shops abound here. 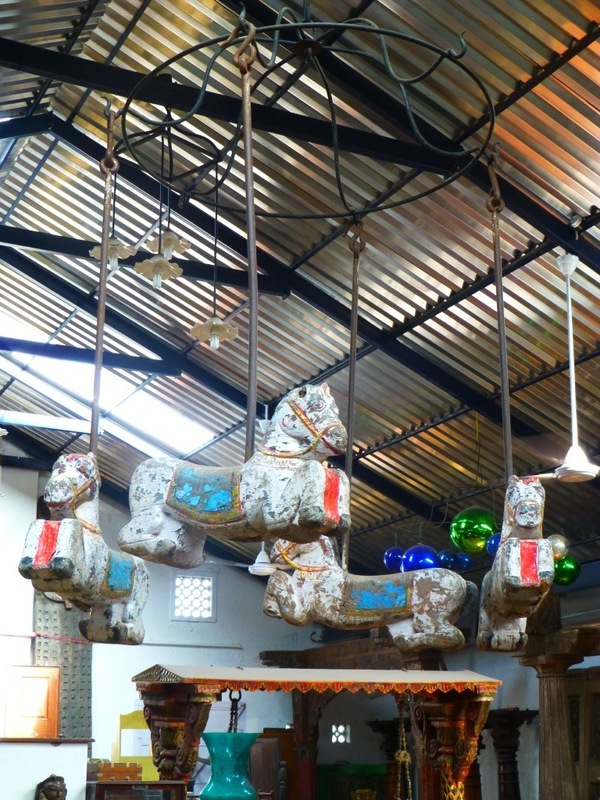 We visited two great antique shops that I would recommend. They were Crafters, V1/141Jew Town, http://www.crafters.in and Classic Exports, V1/206 Synagogue Lane, Jew Town, http://www.theclassicantiques.com. 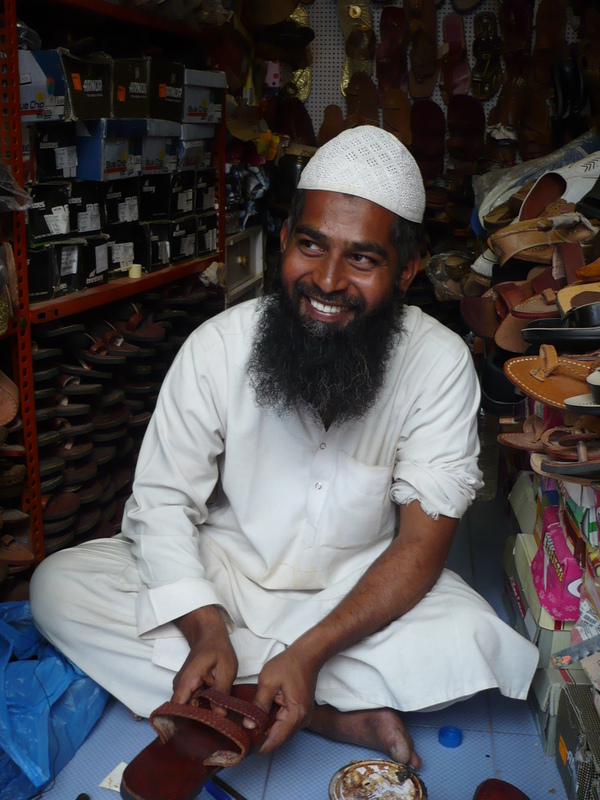 Abraham at Classic Exports was lovely and a real expert on old religious antiques. 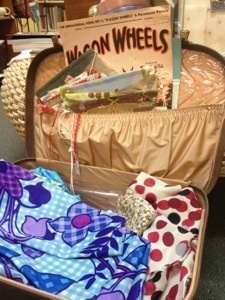 We also visited Little Queen Embroidery (1V/542 Synagogue Lane, Jew Town. 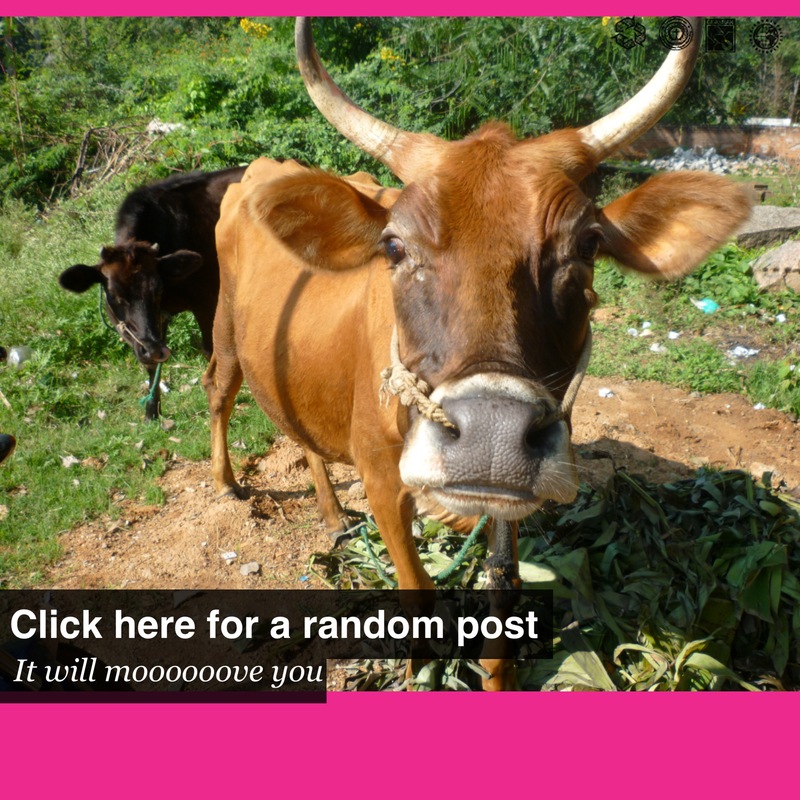 It is a unit of the Village Women Work charity. 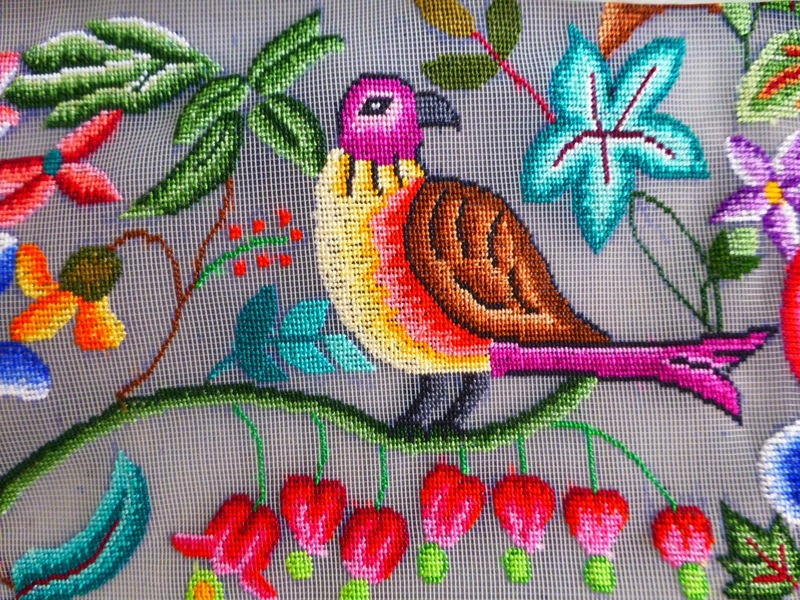 All the divine embroidery is done by widowed fishermen’s wives. We loved chatting to the very knowledgeable Mr Thomas. 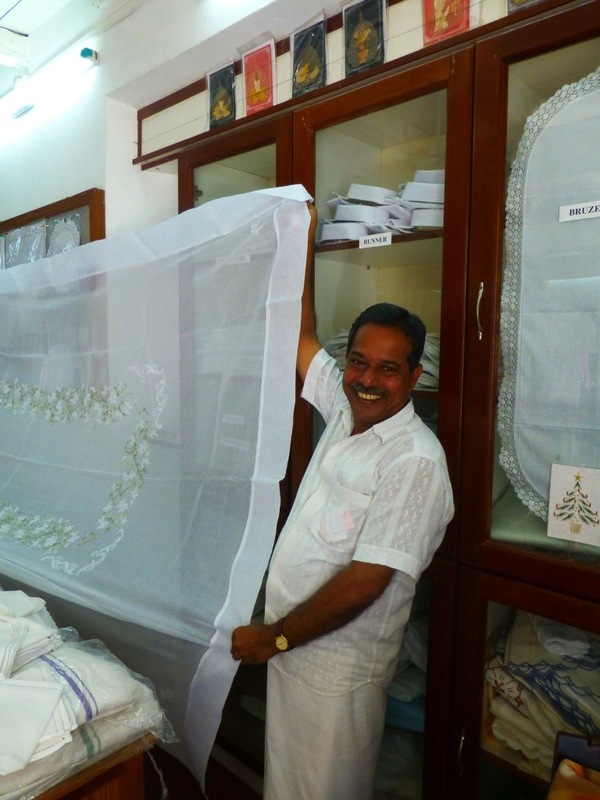 We bought some very delicate hand embroidered hankies. 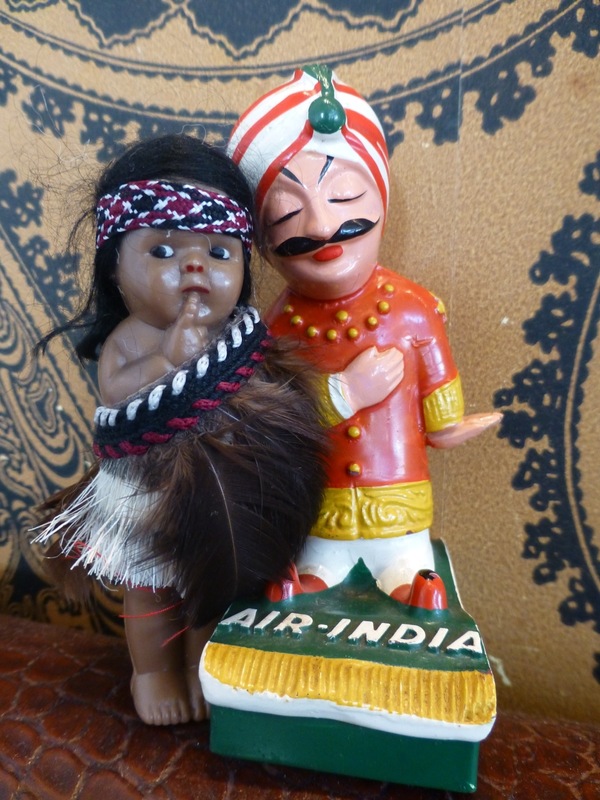 We also did a spot of shopping at Manvi…The Handmade in Rose Street. Here they sell beautiful embroidered shirts and dresses. After a tasty dinner at Koder House in Tower Road we returned to our hotel for Keralan bananas and Marsala chai…mmmmm…delicious. About 5 minutes after we returned to our room a huge thunderstorm broke. A deluge of rain fell and flooded the whole downstairs area. 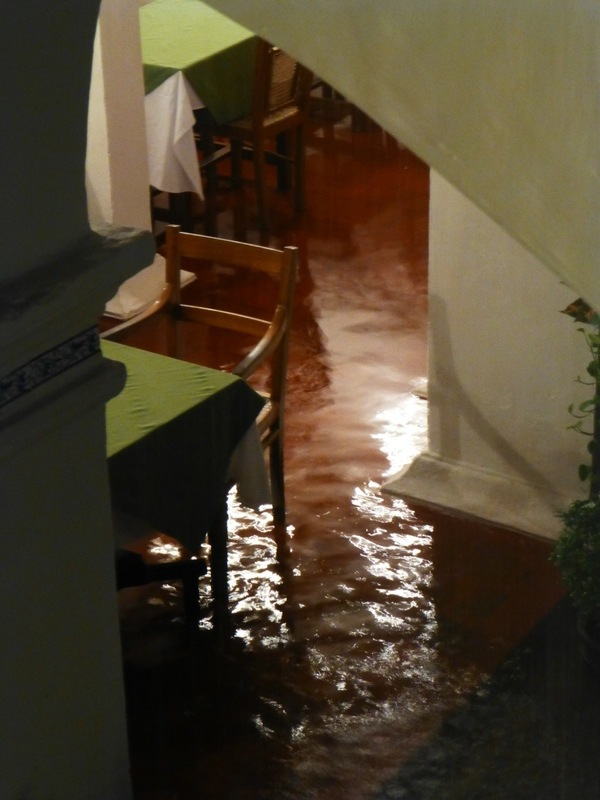 The restaurant where we had just sat was now a sea of water. Yesterday Padma and I had a huge day in the car travelling between Mysore and Fort Cochin in Kerala. 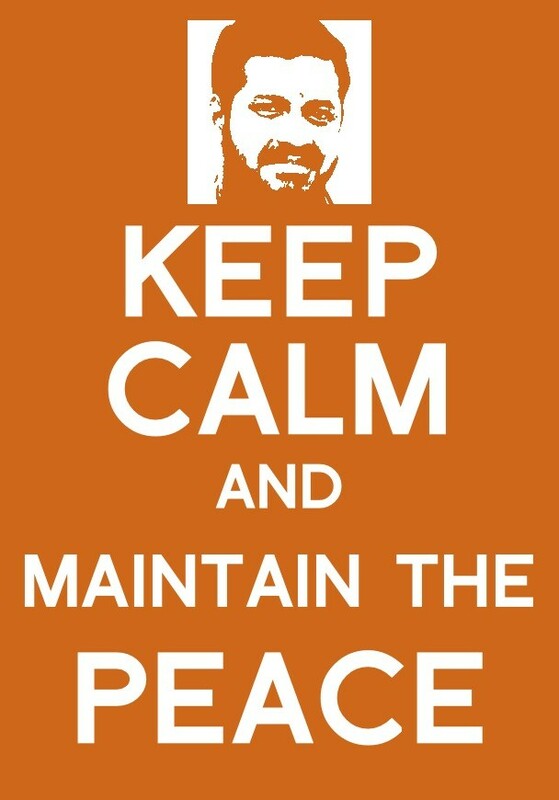 So it was great to have a restful day today. 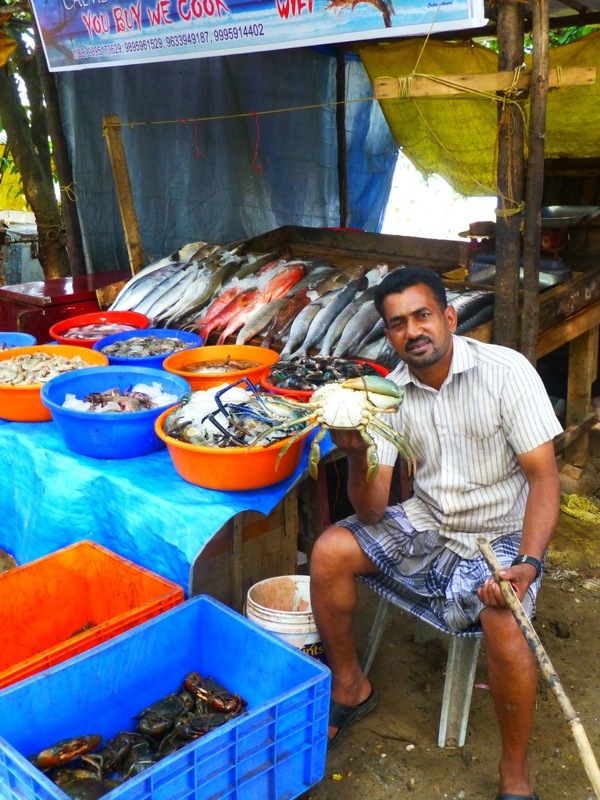 It is 12 years since I was in Fort Cochin last and despite a few new shops it has lost none of it’s laid back charm. We are staying for two nights at the lovely Tower House Hotel. 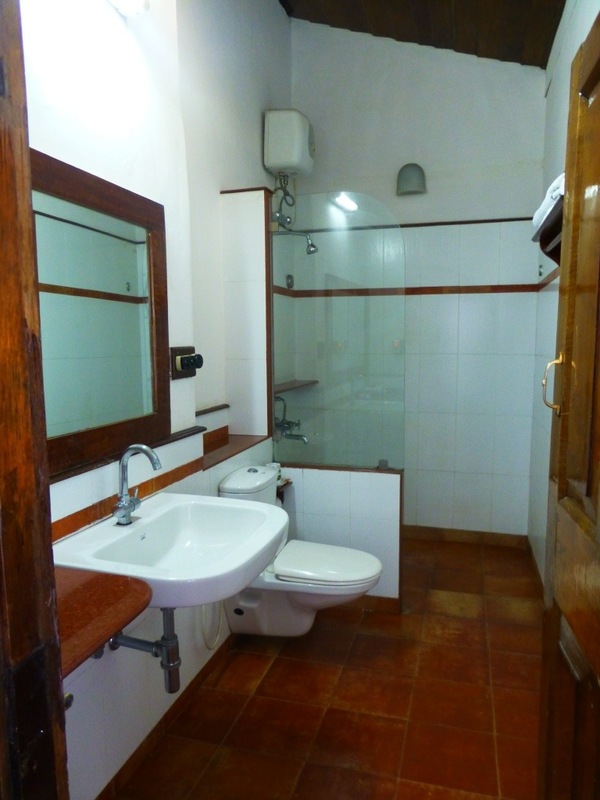 It is part of the boutique Neemrana group of hotels. It is an old converted manor house and is filled with amazing antiques and collectibles. More information on this beautiful hotel will follow in further posts. As we left the hotel this morning we found that they were filming a Bollywood film across the road in the park. 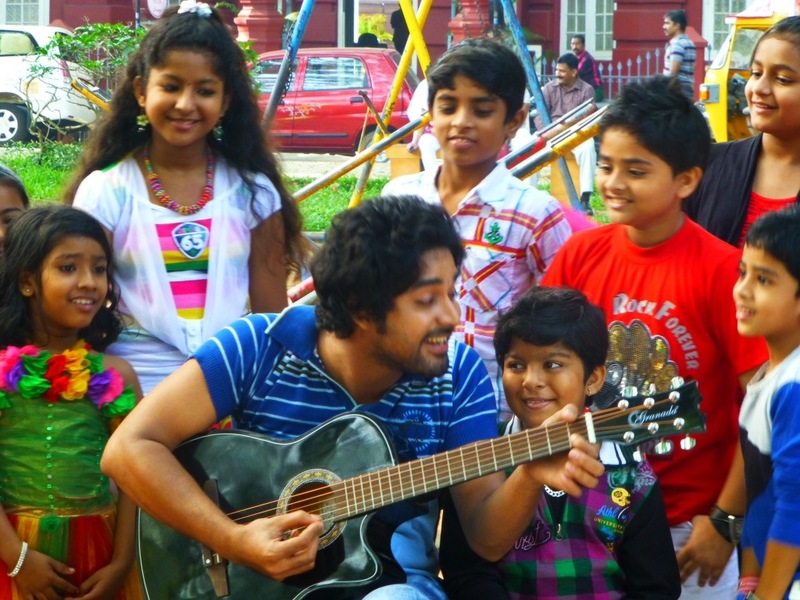 Manu, the lead actor, was miming with his guitar with an adorable group of children. It was a real highlight watching them go over the same scene again and again to get it exactly perfect. 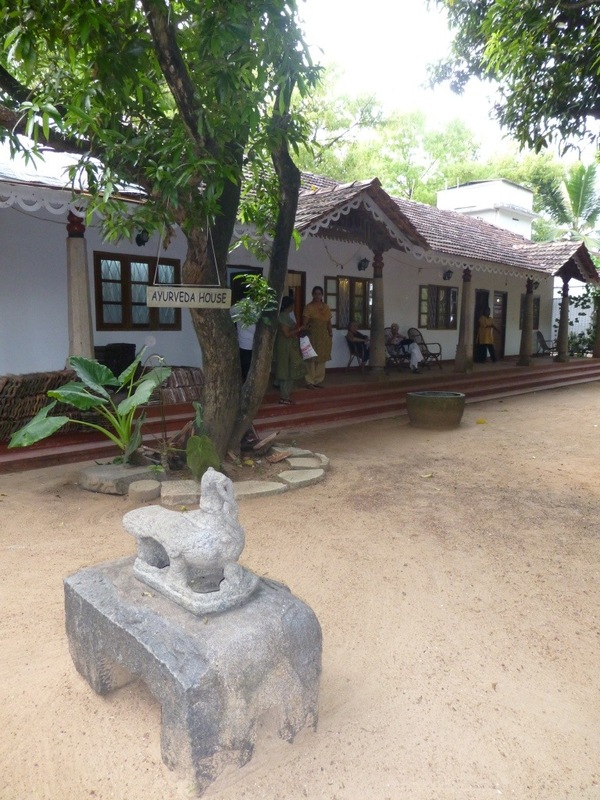 I had a fantastic pedicure at the Cochin Ayurveda Centre (1/620 Santa Cruz School Road, Fort Cochin). The ladies there were so sweet and pinched my cheeks and smiled. 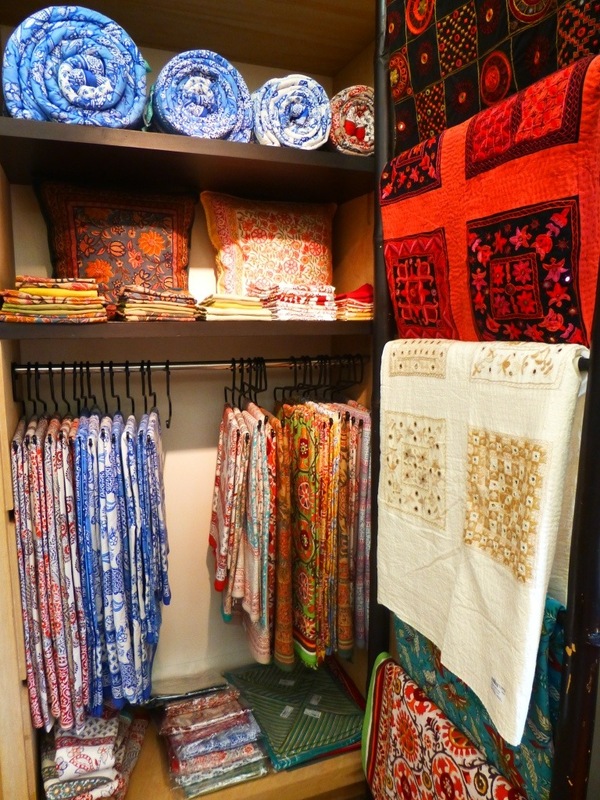 Padma and I then shopped up a storm at Anokhi ( Lily Street, Fort Cochin)…for clothing, tablecloths, jewellery and material covered notebooks. 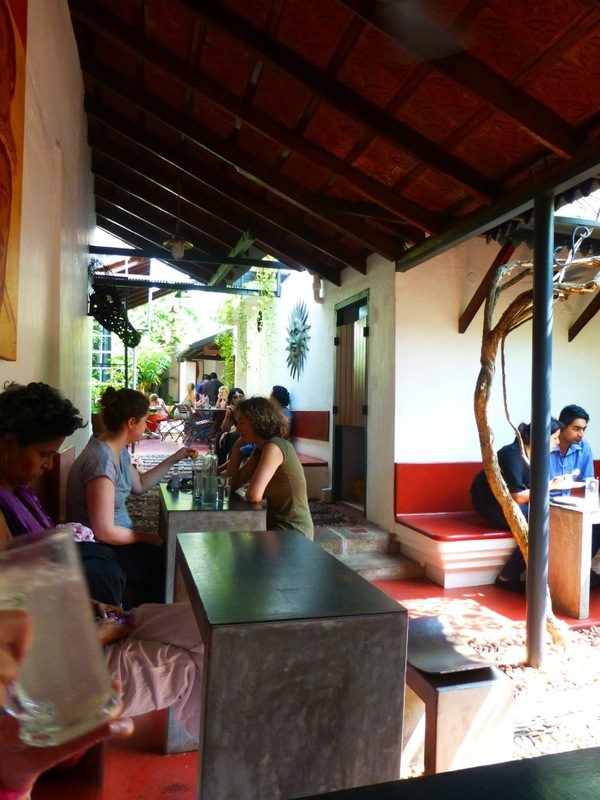 We had a tasty lunch at the Kashi Art Cafe (Burgher Street, Fort Cochin). It has definitely stood the test of time as it was here 12 years ago and still going strong. 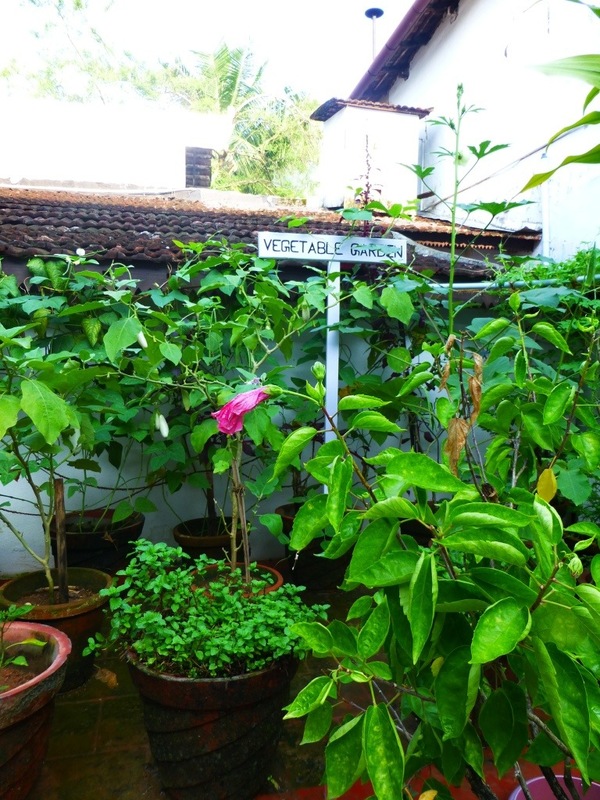 In the afternoon we returned to the Cochin Ayurveda Centre – this time at their branch at the Hotel Fort House (2/6A Calvathy Road, Fort Cochin). 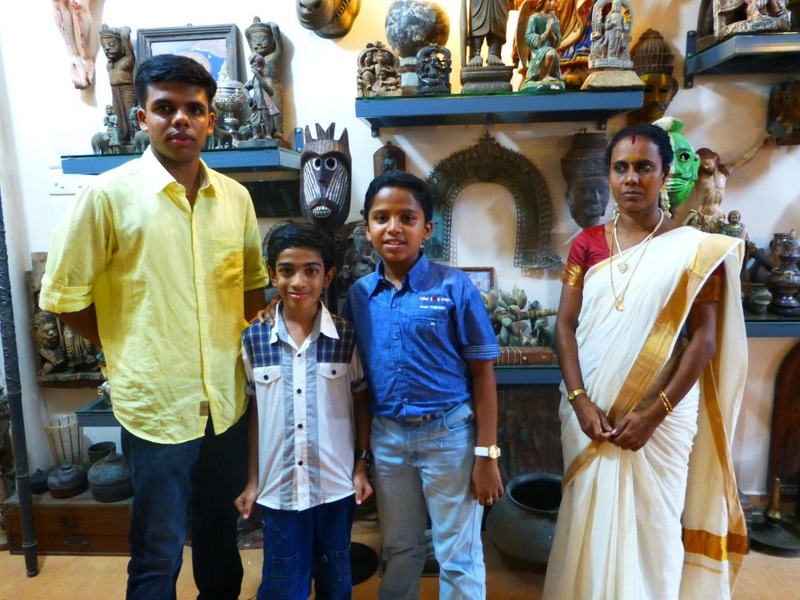 Here I had the Udvarthana massage. 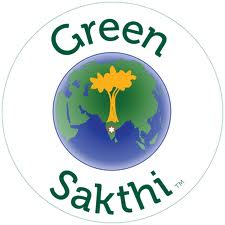 It is a dry herb massage to aid detoxification and nourishment of the body tissues. My skin felt divine after it. For dinner we went to the Old Harbour Hotel (located just near our hotel). 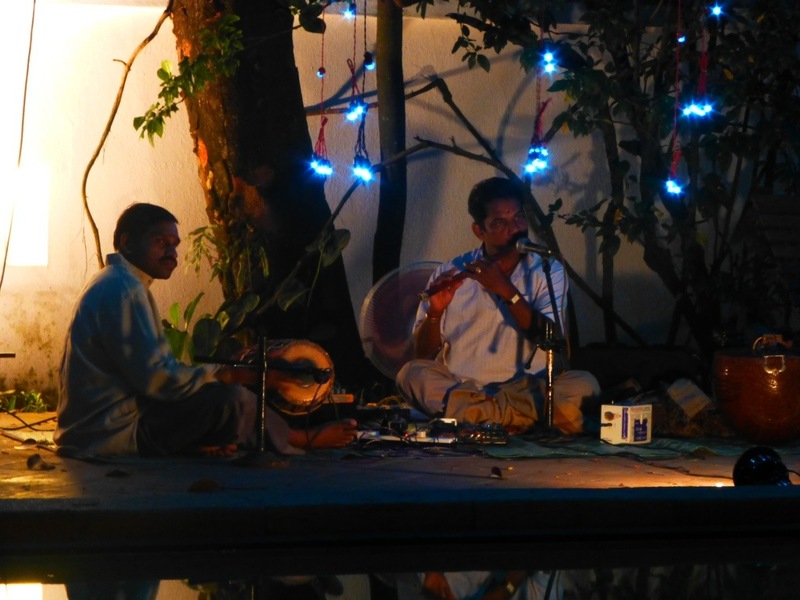 We had a delicious meal there in the garden listening to traditional music on the sitar and tabla drums.